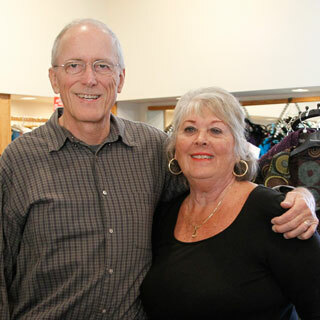 The Last Resort may be a thriving new apparel shop in the heart of Sisters' shopping district on Cascade Avenue, but proprietors Paul and Kathleen Twelker are no strangers to Sisters Country. In 1979, Paul Twelker was president of the Sisters Chamber of Commerce. "We moved to Sisters in 1975 and raised a family in Black Butte Ranch," said Twelker. Paul was a research professor for the Oregon State System of Higher Education before they moved here. The Twelkers decided to try their hand as entrepreneurs in 1975 and opened their first shop in Sisters. "We had antiques, barn wood and stained-glass décor. The shop's name was Weatherwood House. We bought the old wood from the Rodeo grounds when it was on Cascade Avenue," said Kathleen Twelker. In 1984, Paul and Kathleen Twelker moved to Illinois when Paul accepted a position as professor of psychology in Illinois. While he was doing post-graduate work in the early 1990s, Kathleen went back to Sisters to open an apparel shop on Hood Avenue. She named the store The Last Resort, because they both desired to move back to Central Oregon and this was their last-ditch effort to move back home to Sisters. "But after my counseling internship, I decided that I wanted to continue to teach in Illinois, so Kathleen sold the shop after only 18 months and moved back to Illinois with me," says Twelker. "This is our third - and last - The Last Resort," said Kathleen, laughing. "We opened our second store when we retired and moved to Maui, Hawaii, but we still missed Central Oregon. Who says you can't go back? We are happy to be back in Sisters, and so many people remember us!" Paul Twelker walked around their freshly carpeted apparel shop to show a customer a specialty line of clothing for babies through toddlers, called Ruffle Butts. "Whether it's pants, shirts or bloomers, there's that classic ruffle involved," he said. The Last Resort offers exclusive resort wear and casual fashions for women, men and kids. Their selection of tops, pants, sweaters, jackets, dresses, hats and accessories are perfect for all occasions. "We even have a Bearington Bear Collection that any teddy-bear lover would enjoy," says Paul Twelker. "For our clothing lines we specialize in goods from North America, consisting of Canada, the U.S. and Mexico," said Twelker. "We have one line of resort wear that's hand-embroidered and crocheted lace from Mexico. We are the first ones to introduce this line to the U.S."
Whether you're looking for a sporty reversible jacket for fall or hand-embroidered cotton to take on vacation with you, stop in The Last Resort, and you can find it all. The Last Resort is located at 170 W. Cascade Ave. They can be found online at www.TheLastResortApparel.com.